Today, blog is a lifestyle. Everybody should have it. 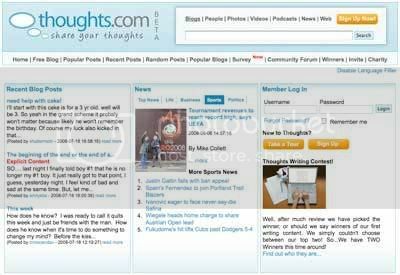 And, I want to introduce the another free blog service provider: Thoughts.com. Yes, like another one, you can blog with this site. But, it is not just a blog provider. It also allows you to upload your photos, and then share it with your family and friends. Do you feel that still photos are not enough? Calm down, you also can upload videos! Great! Now what? you can share your experience with the world. Yayaya, you also can limit it just for you friends or family only. It's up to you. Thoughts.com is more than blog service provider. It's also a social community. Yes, your blog is dying without social life. Interaction between you and the visitors is can help to improve your blog, even "building" your blog. You and "the community" can share the post, photos, videos or even podcast. The another thing about the social, it must be a chat. You can chat with another member, just to say hi, or for a mindshare. Another interesting point, (you must read carefully ), every year Thoughts.com give a free vacation for the top contributors! If you're looking for a Free Blog Service Provider, you should try Thoughts.com unless you still wanna use traditional blog service. 6528 views. This post is copyrighted — materials from other creator are explicitly mentioned. You may use any information for non-commercial purpose with credits and backlinks. For commercial purpose, please let me know first. bro, I really respect for your english in your Blog, but I have not see you yet in that blog? hmz..by the way, myspace.com and facebook.com is most popular webblog in the world which contain many application into one site? Bikin blog baru lagi? Kayaknya nggak deh, secara yang sekarang juga tidak rajin update.